Action: Revolver - single and double action. Ammunition Capacity: 10 shot rotary magazine. 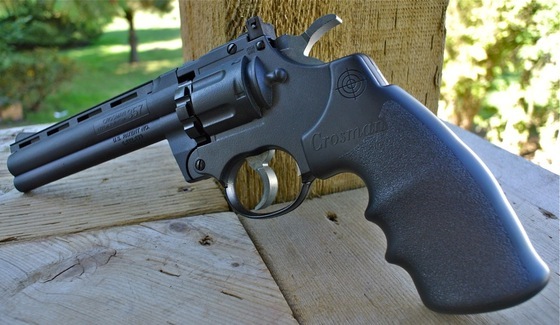 Trigger Pull: The trigger pull on the Crosman 357 is decent in both single and double action. Single action is much shorter and lighter but not overly light with just a very short break to it. In double action it does get heavier and much longer as is expected. People with small hands may have to adjust their grip so they will have enough extension for the entire trigger pull, this is partially because of the larger grips that sit far back on the revolver frame. Accuracy: I found the Crosman 357 pellet revolver to have excellent accuracy, getting about a 1 inch grouping from 30 feet out in a semi rested position (sand bag up front, standing in the back). I also put 6 rounds through my Chrony Chronograph and the Crosman 357 averaged 402 fps using RWS 6.9 grain lead pellets. Build Quality: The Crosman 357 CO2 Pellet Revolver uses a combination of metal and plastic and has a good overall weight and feel to it. There could be more metal (like in the outer barrel) but Crosman used metal parts where they really needed to be like in the main frame, trigger, hammer, CO2 area and inner barrel. This air pistol has been around for a long time and so you can count on all the bugs being worked out. You will not find a great amount of detail in the Crosman 357 and some of the joints seem a bit unrefined but overall it is a nice looking airgun and feels well made. Realism: The Crosman 357 is a replica of the Colt Python 357 Magnum and overall looks similar in shape. I would have liked to have seen a full swing our cylinder but this would have meant a complete redesign and the Crosman 357 main design goes back to the early 80's. 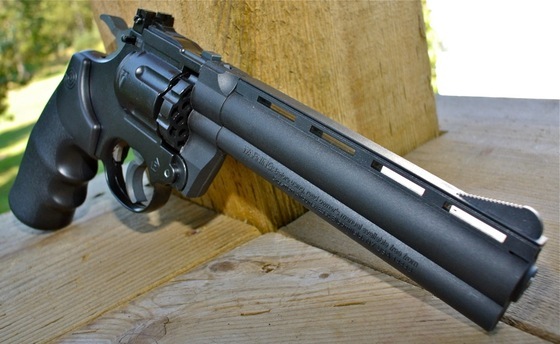 Yes there are some newer revolver styled airguns like the Dan Wesson that have full swing out cylinders (BB only) but I still would have liked to have seen this, maybe on a future updated revision? Available in the:Replica Airguns Store. Inexpensive Pellet revolver, not really any other pellet revolvers out there to compare to. Good usage of metal parts. (Metal trigger, hammer, frame, barrel, CO2 tab screw). Excellent accuracy and good power with a reasonable amount of shots per CO2. Can mount optics on the dove tail railed barrel. High capacity 10 round removable magazine. Grips and trigger pull length may be a bit long for smaller handed people when shooting in double action. Some of the finish detail could be better (seems). A slight recess on the inner barrel would have added to the realism. 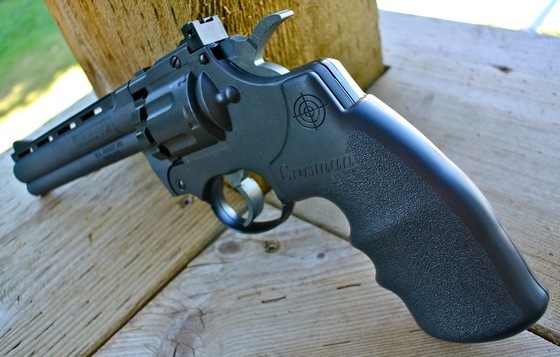 Reviewing this fun Crosman Pellet revolver was a bit of a walk in the past for me. back when I was in my early teens I had one and it went with me on just about all of my back woods adventures. I'd have to say I learned how to shoot with this pistol and it felt right at home back in my hands after all these years... Back in the day I didn't do any scientific testing with my Crosman revolver but I can tell you it shot hard and true then, just like it does now! I'm not sure why I held out so long getting another one, the price is right and if you are looking for a nice multi-shot pellet pistol with excellent accuracy and good power for well under $100, the Crosman 357 might just be for you.